The footer section of every site is typically the most ignored section when establishing and designing a website, be it WordPress or a full HTML site. Many of the designers don’t take the footer section very seriously because they think that the majority of the users don’t reach the bottom of the site where, naturally, the footer is located. However, the footer section of a site is as important as any other part of a website. It contains vital information, such as links to the important pages of the site, contact information, policies, copyright details, and a lot more that will add value to any site and enhance the site’s credibility. But just like any other part of a website, the footer section is also not as easy to build as you think. Fortunately, there are footer plugins on the Internet which can help you create a footer section for your WordPress site faster, easier, and without the need for coding from scratch. To help you find the perfect plugin for your WordPress site, we’ve gathered 15 useful footer plugins that can easily help you build the footer for your website. Add to Footer also comes with a built-in support for Google Analytics and Statcounter v1.3. Custom Admin Footer text is an advanced footer plugin that lets you customize the text on the left and right admin footer or overwrite the default text and links with any text you want. This footer plugin is perfect for WordPress developers working on a client site that needs support links, bylines, or credits in the footer. Footer Mega Grids Column is a free footer plugin offered by WP Online Support that lets you create footer areas in a grid or any column depending on the necessary requirement of your theme. This footer plugin also lets you add a widgets area for your theme and allows you to add and display any kind of footer widgets in grid view with supported multiple columns. 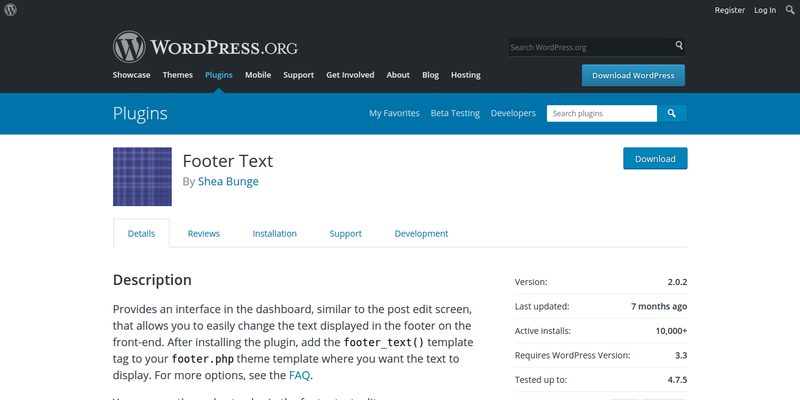 Among the footer plugins listed here, Footer Putter is by far the most popular footer plugin. Footer Putter allows you to create a footer with ease and boosts the online presence and credibility of your WordPress site to the users and search engines alike. This footer plugin also offers footer hook setting that allows you to add a footer in just the right place on the theme. Footer Putter offers two widgets: a Footer Copyright Widget and a Trademark Widget. These two widget can give your site accreditations and demonstrate that your business is legible and meets the required standards for any industry. This WordPress footer plugin is very easy to use. After you have installed this plugin, add the footer_text() template tag to your footer.php theme and placed it anywhere you want the text to display. Footer Text also provides an interface in the dashboard that allows you to easily change the text showed in the footer on the front-end, similar to the functionality of the post-edit screen. Footr is a very simple WordPress footer plugin that offers you a unique kind of footer animation. It offers a fully responsive Footer Reveal feature which will be hidden on the first load of the page and will be revealed once the users scroll all the way down to the bottom of the page. Footr helps you create widget-driven content, providing you with professional options from a simple WordPress widget to a fully customizable design that can be easily added to your site. If you are using Genesis theme for your WordPress site, you might want to consider using this footer plugin specifically made for that theme. Using the Genesis Custom Footer, users can easily modify or replace the built-in Genesis footer credits or the custom footer copyrights area offered by this plugin. You can also use any of the existing Genesis footer shortcodes to create your footer. You can also use your HTML or a simple text. You can also add important links in the footer section using this footer plugin. This footer plugin is compatible with any Genesis child theme—it does not matter if it is created by StudioPress or by a third party developer. HayyaBuild is a powerful WordPress plugin that offers drag-and-drop functionalities to create a fully responsive footer section as well as header section for your site. This plugin allows you to create multiple headers and footers with variations. This plugin is ideal for designers who are creating WordPress blogs or websites. It is an easy-to-use plugin that will help you save time and effortlessly grab a huge number of visitors. This footer plugin is very useful when customizing the header and the footer of your WordPress theme. It lets you insert codes like from Google Analytics, custom CSS, Facebook Pixel, and more to the header and footer of your site. Insert Header and Footer plugin is considered an all-in-one plugin. Its interface allows you to have one place where you can insert scripts, codes, and other things rather than downloading dozens of different plugins so that you can only deal with what you want. This footer plugin also makes sure that you don’t lose the footer codes if you decide to change the theme of your WordPress site. When it comes to social sharing plugins for WordPress, Monarch is one of the best plugins to use. They offer footer section which gives the users an option to share the content of your site and follow your site on any social media. Monarch provides you with a wide selection of options in terms of the design of the social sharing buttons and you can easily modify the footer section of your site to help you receive more traffic from the social media sites. Apart from that, Monarch also has a detailed panel for admin options where you can manually set your desired settings for this plugin. Royal Footer Bar is one of the most easy-to-use footer plugins for WordPress. It has a flexible interface and fully responsive professionally designed bars which will help you get more subscribers and convert your one-time site visitors into regular customers. The footer section of this plugin can be used as an e-mail opt-in tool which will capture user names and e-mail addresses and integrate it with all leading e-mail services providers like MailChimp, AWeber, GetResponse, and other e-mail clients. Other features of this plugin include displaying ads, A/B split testing, page level targeting, and a full report of the number of views, clicks, and overall click-through rate of your site. Smart Footer System is one the most advanced footer plugins out there. It does not have any restrictions and even allows you to do an unparalleled footer customization. You can create a footer section with drag-and-drop and build infinite footers using the leading page builders like Visual Composer and Elementor Builder. With this footer plugin, you change its “per-page” or “post” basis to make your site a hot target. Smart Footer System also comes with a fully responsive footer section so that your footer will still look great on any device and screen size. 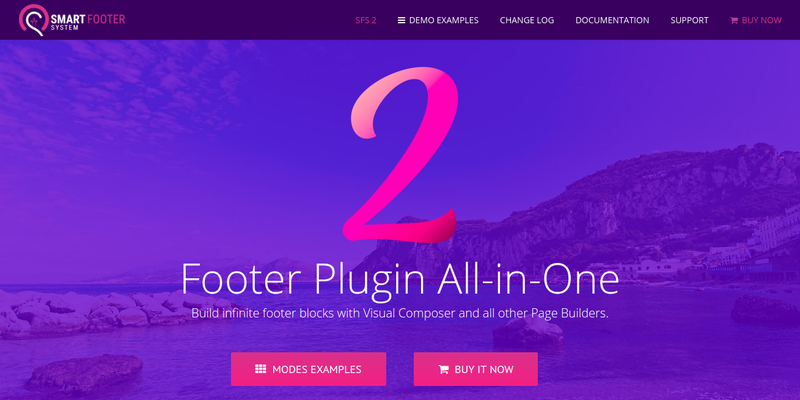 The best part about this plugin is that it has several footer modes, such as normal footer mode, sticky footer mode, slide up footer mode, CSS3 footer mode, and a lot more. Storefront Footer Bar is a simple footer plugin that lets you add a full widget region above the default, columnized Storefront footer widget area. With this footer plugin, you can edit and modify the display of your footer section by adding images, icons, and background. You can also tweak the color of your footer using the built-in customizer. But in order for you to use this footer plugin, you must install and use the Storefront theme. WP leFooter is a WordPress footer plugin that allows you create a footer section faster and much easier. It gives you an additional slide-up footer feature on your site and a fully modifiable custom footer that can easily be placed on your site. WP leFooter also comes with five predefined themes and layouts with matching color settings and a multiple slide-up footer animation powered by jQuery. YITH Footer Banner is a great footer plugin that enhances the appearance of your footer section. You can customize your front-end page by configuring the setting of this plugin under Appearance > Footer Banner. YITH Footer Banner also offers you an easy-to-use and comprehensive admin back-end which you can use to customize the appearance of your footer banner. This footer plugin comes with an option to advertise your product and an opt-in email list tool to collect e-mails from your user group to your newsletter list.